Last weekend, Andrew and I celebrated ten years of togetherness. Lots of food was had. Naturally. We also had a not-so-great stay at a hotel I was excited to give a try to (stray hairs, dirty mugs, sliding bathroom doors that didn't totally close, and Family Feud audition craziness [which I will forgive]) but I'd prefer to focus on the meals. We started our Saturday with a late-ish brunch at Hunky Dory, a British influenced place that we visited for dinner before the holidays and neither loved nor hated. 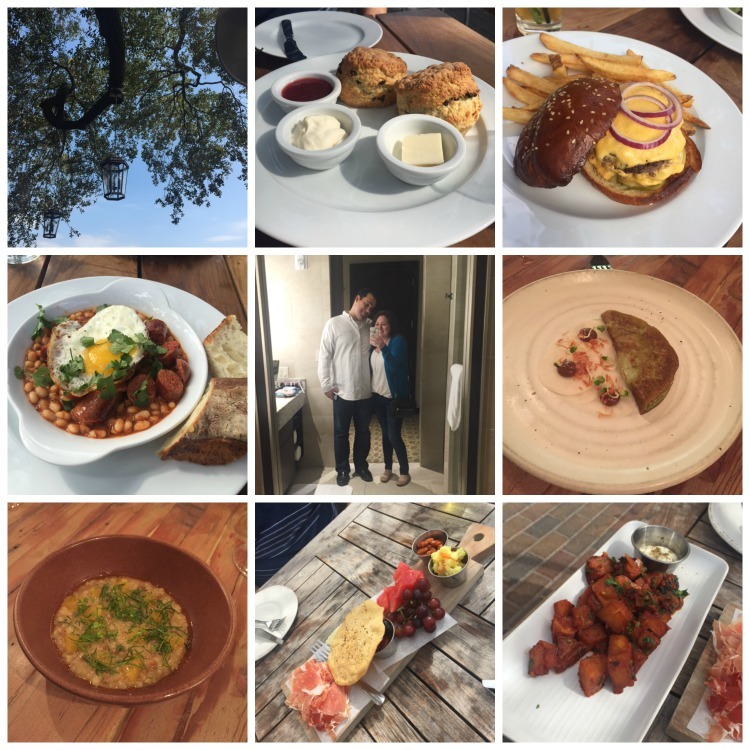 It was amazing outside - in the high 60s - so we completely enjoyed the patio. However, our server kind of forgot about us out there. We started with cocktails - a Pimm's Cup for me - and an order of scones. My fellow Americans, let's embrace clotted cream and jam because it's an amazing combo. The scone was sweet without feeling like dessert and dense without being dry. Those things they call scones at Starbucks couldn't be farther from what I enjoyed that morning. For my actual meal, I had the HD burger, which was a boring choice, but it was done so well that I didn't mind. The housemade pickles stood out and I wish I had a side of them to enjoy on their own. The fries that accompanied the burger were the perfect blend of crispy outside and soft inside and could have benefitted from a dousing in malt vinegar, which I didn't notice on the waiter's stand until after I finished the last one. Oh well, next time. Andrew ordered lamb sausage with beans. It came with a fried egg on it (I'm weird about eggs) and it sounded like a strange combo, but I completely enjoyed the bites I had and especially loved using the ciabatta included with the dish to sop up the sauce. Overall, it was a great meal to start our anniversary weekend. A few hours later, we opted to start our evening at Public Services, which is 100% our favorite bar in Houston. The owner is so ridiculously excited about the entire menu that you just want to sit and talk to him about what he's serving and tell him your mood to get a recommendation. We got there in plenty of time for happy hour - where all wines are half off - and loved everything we tried, including a bottle Andrew has already hunted down and purchased at a shop here in Houston and a glass not normally offered by the glass, but since it was that night, I had to try it. A few drinks in, we had to try the gulf fish spread. One of the servers recommended it, and since every other snack we have had there has been phenomenal, we went for it. The closest thing I can compare it to is smoked salmon cream cheese, but it was really nothing like that. It was the texture of whipped cream cheese, and it tasted like fish in the salty, savory sense, but not in the stinky, fishy sense. It was served with plain saltine crackers so you got every opportunity to enjoy the spread itself. Now, not only do I want to go back for Public Services' amazing housemade baloney, I want the fish spread, too. We had dinner reservations at an all time favorite and possibly the best restaurant in the city, Oxheart (whose chef is again nominated for a James Beard award as of this week!) so we eventually made our way there. I love Oxheart and will continue to suggest it to some others, but this just wasn't my favorite menu that I've ever had there. There was a savory crepe that I would have loved more of and porridge that was fantastic and an interesting dessert made of a fingerling sweet potato and vanilla, but not as many "I can't believe I'm eating this" moments as I've had in the past. It was still a fun dinner with great service and an always fun vinyl soundtrack during our two hour meal (Bruno Mars prevailed during this visit). My least favorite Oxheart experience will still be better than a decent experience at many other places, and it wasn't bad by any means; it just wasn't the best. Since I probably eat as much as a small horse, of course I was ready to eat again the next morning. We had Valentine's Day brunch at Oporto Fooding House, which is one of the dumber restaurant names I've ever heard, but the menu was appealing. It was another beautiful morning spent on the patio, albeit really windy. Oporto's menu had a bit of a Spanish flair, and we were the most intrigued by the small plates. Two of the plates we tried were kind of duds: a spinach/cheese/mushroom dish that ended up being a huge, spinach and cheese stuffed portabello that did nothing for me. It was like eating any other stuffed mushroom I've ever had except gigantic. We also didn't care for a potato bread with chorizo. I love chorizo, but this had no flavor and I only finished my part since it was there. However, the petiscos plate with ham, cheese, pickled vegetables, nuts, and other snacks was surprisingly good. I loved the combo of all of the tastes and textures. Our favorite item of the day, though, was the Spanish potato dish that was smokey, a little spicy, and accompanied by an aioli that calmed everything down just enough to make me want to order a second plate of these... but I refrained. I'd be all over that gulf app dish whatever at Public Services. That is right up my alley. The petiscos plate too. I love going out on a high note before I start eating healthy again. Brian isn't as big of a fan but I can't help it! I'm jealous that you have such fancy places to eat, I sometimes wish we lived closer to places where we could eat food award winning chefs have made. Oxheart really is such a great restaurant! We ate there for an anniversary one year, and although my husband didn't love it as much as I did, it was still a fantastic meal! I think that sometimes there can be meals that are good just not your favorite, like you said.